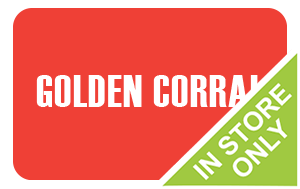 Purchase a discounted Golden Corral gift card and save money on your entire bill! Not only does this restaurant offer more food than the mind can imagine, but they also have over 500 locations across the United States! And the great news is, you can use your gift card at any location, anytime! What’s more, any balance left over can be used on your next visit! Finally, you can have an endless amount of food- for less money! Do you have family members who are picky eaters and differ from one another in their taste? If so, then this is the perfect solution! Surely there are few places where you can find this much food under one roof! From their weekend breakfast buffet to bakery & desserts and everything in between- they have it all! Perfect solution, right? And when you use a discounted Golden Corral gift card you will pay less on your entire bill! Why not leave the cooking to someone else and stop in today? You will find something for everyone in this restaurant! They offer a hot buffet, salad buffet, hot soup & potato bar, sundae bar and much, much more! Buy your discounted Golden Corral gift card and treat yourself or someone else to the fun of endless choices! Your discounted Golden Corral gift card is your ticket to saving money on food that is sure to please! Cards2Cash also offers gift cards for many other restaurants and retailer shops! If you would like to save more money every day, then check out our listings for Ryan’s Steakhouse, Old Country Buffet, Western Sizzlin, Ponderosa Steakhouse, and more! With Cards2Cash on your side, you can save more money than you ever have before on the restaurants you love! Do you have a Golden Corral gift card you aren’t going to use? Cards2Cash buys gift cards to lots of restaurants and retail shops! Not only that, but we pay top dollar them! If interested, stop in one of our retail locations for on the spot payment, OR just fill out our online form and we’ll get back to you with an offer! Cards2Cash is your sure bet for saving money!